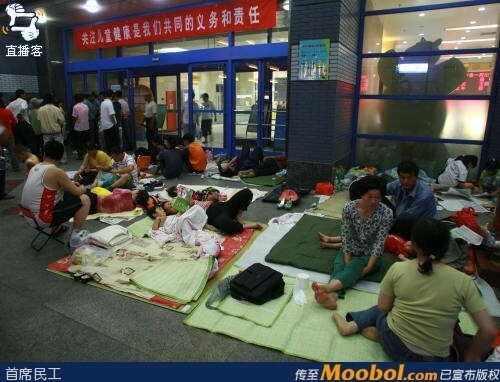 Late night, June 12 2007, over 100 parents of sick children, and some children themselves, sleep on the ground in the underground parking garage and on the disabled ramp outside the doors of Beijing Children’s Hospital. In order to save the 20 RMB nightly cost of staying at the hospital, the underground parking garage has become a residence for the poor families and children who have come from around the country. The temperature in the underground parking garage reaches 35℃. Who would put up with this if they had enough money? Medical costs are expensive enough that taking a child to the doctor basically empties the family coffers, so the adults have to save when they can. The Chinese medical system seems strong, but if you look closely it only addresses a certain group of people. It’s only the rich who can see the doctor, and those without money just have to take it. Exorbitant medical costs make the common people shrink and the high cost of medicines drives the common people crazy. Could it be that in the future the common people will just die on the street? The medical industry has so many dark sides. Better not to have kids at all. The long travel to Beijing to see to the child’s illness means that savings are long gone. The hospital only has beds for patients, why would they have beds for caretakers? Why do people have to go to Beijing to cure sickness? It can’t be that there are no local hospitals? Of course they won’t be able to handle the high costs of Beijing. Even if people follow others blindly, they still have to consider their own economic strengths. Outsiders coming to Beijing is like Chinese going to the United States, it’s definitely difficult. China’s healthcare system reform is being reformed daily, but there seems to be no affect; at any rate medicines cost more and more! It’s harder and harder to see the doctor! Every big hospital in Beijing is the same situation. Last year I saw a couple who came to Beijing to seek medical treatment for their child. The mother stayed in the room with the child but the father couldn’t spend the 20 RMB for the bed and slept in a chair in the hospital hallway every night. For his own meals it was just two steamed buns, but he didn’t forget to buy his daughter some grapes or an apple each day. Pity the parents’ heart.